Tula’s little cutie, who I’m just going to refer to as “Heart Puppy” from now on, is doing gloriously well. She’s gained over two ounces, going from 9.3 to 11.6 in just three days. Tula is the epitome of a good mommy, with a clean, sensible and calm attitude that radiates competency. Her basic attitude when I’m in the room is “Hi, nice to see you. Please don’t touch my puppy or move anything around, and we’ll get along just fine”. Frenchie moms, even the best of the them, can sometimes be a little bit frantic and overly worried (if they’re not being slack and lackadaisical), so this is a nice change. There’s a new set of puppy photos over on Flickr, and a new video short at the end of this entry. By the way, I’m taking advantage of the Collections feature on Flickr, which I’ve previously under utilized, and will be cataloging all of Heart’s photo sets into one collection, which you’ll find here. I just finished watching the CBC documentary “Apocalypse Cow“, and was left with a feeling of dread and dismay at how poorly the Canadian government handled the entire situation. Instead of listening to their own scientists when they preached universal testing of all slaughtered cows, they held “We Love Canadian Beef” barbecues. Instead of tightening feeding regulations, they fired the scientists who recommended it. A prevailing attitude of “If we ignore it, it will go away” was rampant then, and continues to be now. In Japan, every single slaughtered cow is tested for BSE before being processed — a practice that has restored that country’s faith in beef, and has practically gauranteed that BSE infected beef won’t make it into the food chain. In the US, Kansas Meat Packer Creekstone Farms Premium Beef wanted to give their customers the same kind of assurance, by testing each and every cow they process for BSE. However, as Kim reports over on Pet Connection, the US government has gone to court to prevent Creekstone from testing their beef. Yes, you read that right — the US government took a meat packer to court, to force them NOT to test their beef for BSE. Why? Well, because if Creekstone does it, other Meat Packers might look shoddy by comparison for not testing every single cow.The fact that they should look shoddy isn’t considered valid, and yet again another government goes to bat for big business, and against food safety. Nice work, Department of Agriculture. Look, consider this forewarned — I have a puppy here now, and more on the way, so this blog is about to become booooring, in the way that only new and doting Mommas can manage to be boring. Yes, that’s right – pictures. I’m going to be posting lots and lots and lots of pictures. In the interest of trying not to alienate all of you, I’ll likely post my favorite of the day over on the Photo Blog, and a link to the Flickr galleries here. When it comes to videos, though, all bets are off — I am not strong enough to resist wanting to post videos of the pups doing super cute pup things (like wiggling. And sleeping.). 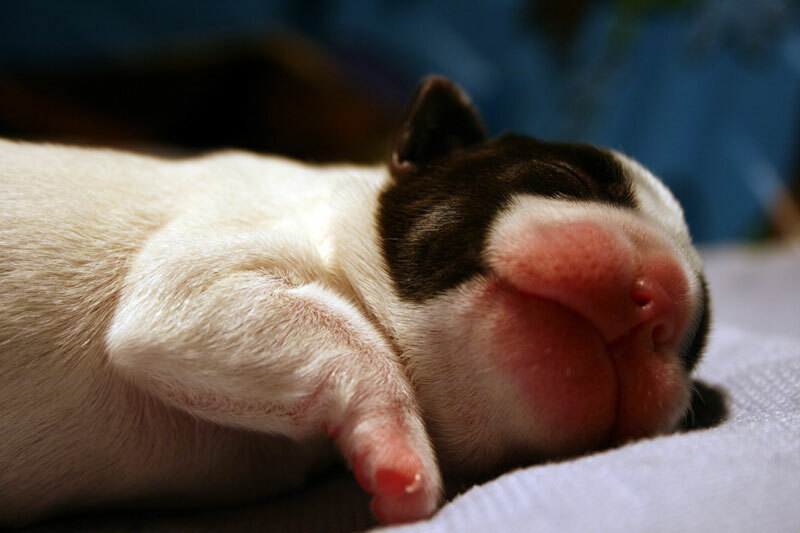 Anyway, photos of the little cutie, taken at one day old, are posted here. Poor Bunny. She’s going through a serious case of crazy Mommy syndrome, which I have to take partial responsibility for. I was hauling out the weekly load of dog beds for washing, and tossed a dirty whelping pad from Tula’s room onto the top of the pile. Bunny was on it like a Bloodhound, sniffing and pawing and digging around in it frantically. You could see the wheels turning in her head “Where’s the puppy? I know there’s a puppy in here. Oh my God, she tossed the puppy into the pile of laundry!”. Bunny then proceeded to warn all the other dogs to “GettawayfromypuppyorIkillya”. Elliott took one look at her snarling, and tossed me a look that said “Chicks, man. They’re all crazy”, before strolling away nonchalantly. I dragged the pile of laundry into the laundry room, Bunny following along behind me making nervous little whining noises. Once there, I faced a dilemma — toss the dirty pad into the washing machine, possibly giving Bunny a breakdown, or leave it dirty for her to fuss over? I chose dirty. I was about to wash it, then noticed Bunny was staring at me, and I couldn’t deal with the idea of her thinking “Aiiggh! She put my bebbeh in da washing machine! Must save bebbeh!”. Fine, yes, she’s probably have just wandered off to eat a television, instead, but why take a chance? So, the dirty pad sat on the floor, on top of the quilts we keep on the couch, and I figured Bunny would lose interest in it eventually, once she’d something new and expensive to eat. 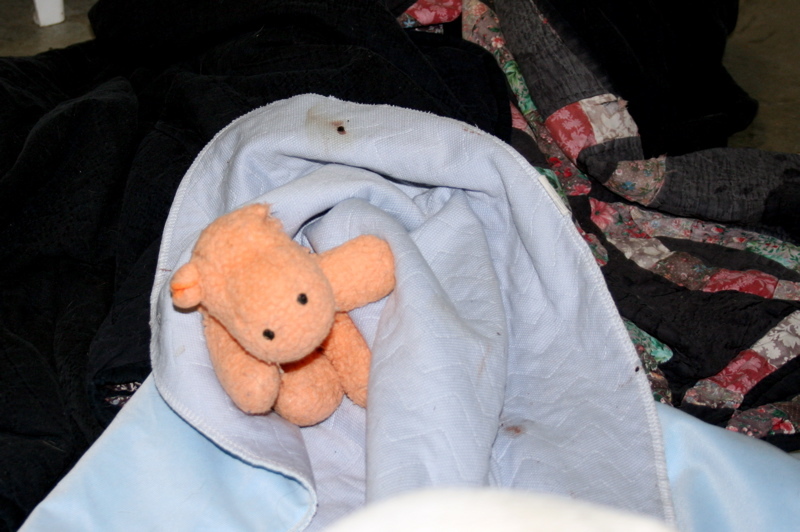 Not so — instead, she found a small, orange stuffed hippo thing, and has now decided it is, in fact, her missing baby. She’s buried it in the middle of the dirty pad, and keeps digging it a deeper, safer, more secure bed — one hopefully free from the risk of being tossed into the giant swirly bathtub machine. Bunny now refuses to come out of the laundry room, which is fine for now, but will be a bit troublesome when it’s potty or food time. On the plus side, I can probably now wash the pad without freaking her out, but no one had better touch her baby. Think there’s any family resemblance? https://i0.wp.com/www.bullmarketfrogs.com/wp-content/uploads/2013/06/teddy_tula.jpg?fit=645%2C430 430 645 frogdogz http://www.bullmarketfrogs.com/wp-content/uploads/2015/06/bullmarket-logo.png frogdogz2008-08-30 11:23:152013-07-10 20:27:01Let the photos commence! Have you been thinking of redecorating your study? Tired of the Chinoiserie look that was all the rage a few years ago, and ready to move onto something more au courant? Coming hot off the heels of the Olympics, The Sun Sentinel newspaper offers this riveting piece of ‘lifestyle’ journalism, in which author Vicky Moon and decorator Susan Rubin suggest you think horses, not zebras. What’s the easiest way to achieve equestrian style? Author Vicky Moon and Wellington decorator Susan Rubin offer 10 tips. 1. Scour antique shops and flea markets for old paintings, trophies and china. 2. Think British. The American rodeo and Wild West don’t translate well to home decor. 3. Don’t be put off by objects that aren’t perfect. Equestrian-style is rarely pristine or crisp. You know, in my experience the easiest way to achieve equestrian ‘style’ is to stick a big, badly in need of cleaning and polishing saddle in the middle of the room, preferably on newspaper. For added ambiance, leave your manure crusted barn boots beside it. Next, hang some sweaty saddle blankets on any available drying surface. Leave some bottles of liniment and copies of Horse and Rider scattered on any left over surfaces, and intersperse with mid polish bits and pieces of tack, and voila! “Equestrian Style”, or at least style as I know it. But, hey – I’m not a decorator. Little did I know that the best way to achieve this pinnacle of fabulousity it to run out and buy a dog. Or a pair of them, to be more accurate. 7. Make room in your life for not one, but two dogs. 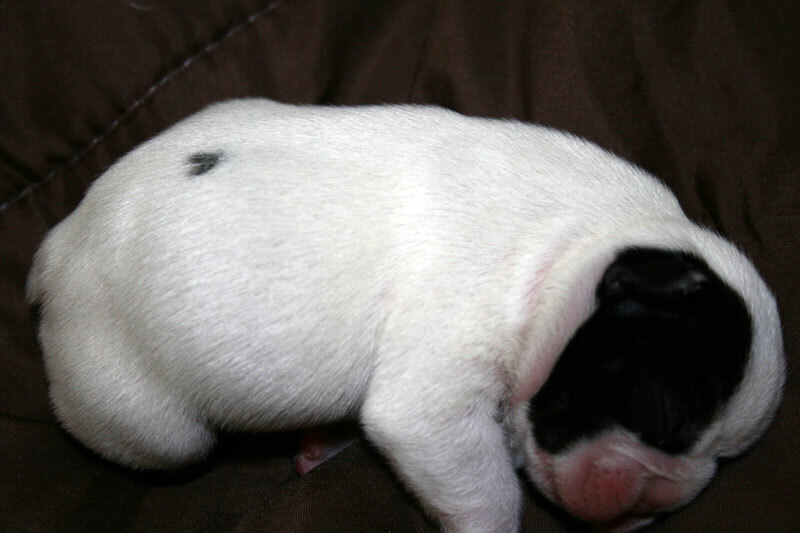 You have a choice of three breeds: Jack Russell, Corgi or — the hottest dog among the horsey set — a French bulldog. Oh, how wonderful! Dogs as decorating items (well, more so than they already are). Anyone who rescues has already heard of the dog surrendered for clashing with the new sofa. Now we can look forward to dogs being turned in because they’re no longer in style. Of course, there’s more to Equestrian Style than just some used trophies and a pair of Frenchies. Good heavens, you need to get a horse (of course). I wonder if anyone pointed out to either of these morons that horses aren’t usually kept in the den? Mind you, building a barn could also help to add to the ‘ambience’, I suppose. Plus, when you’re tired of it, you can pass it on to those nice people at the feed lot up in Canada. Horse meat is so Euro Chic.